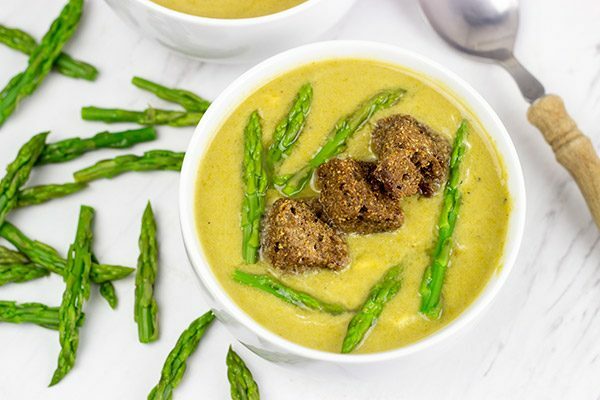 This Skinny Asparagus Soup makes for a great low-calorie meal on a chilly day! So what is your first fancy recipe that you learned to make? 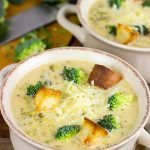 Without the croutons, I estimate that this soup clocks in at just about 80 calories a cup. 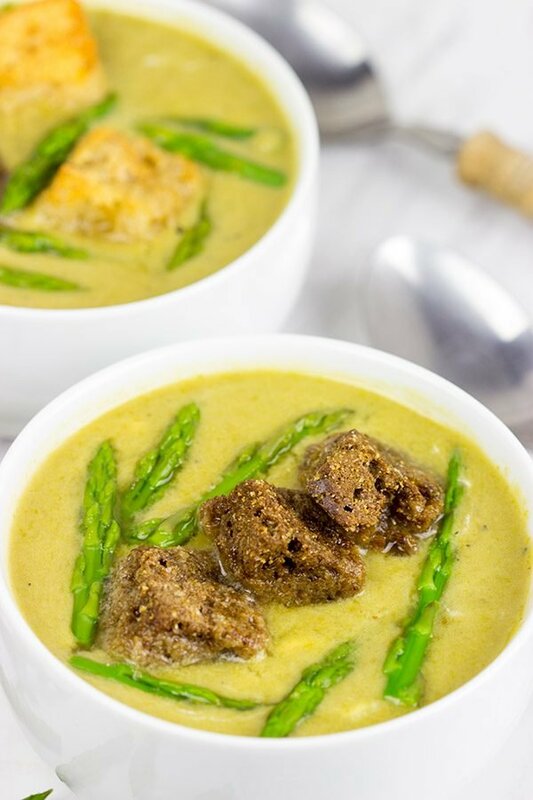 That means I can have a nice big bowl of this Skinny Asparagus Soup…and still have room for dessert! Because that’s how I roll. Cut top 1-1½” off tips of the asparagus; set tips aside for later. Cut remaining asparagus into ½” pieces. Using a large stock pot, add olive oil. Place over medium-low heat. Once hot, add onions and garlic. Sauté for 5-6 minutes, stirring occasionally, or until onions begin to turn translucent. Add asparagus pieces and continue cooking for 5-6 minutes, stirring occasionally. Add chicken stock, salt and pepper; bring mixture to a boil. Reduce heat and simmer uncovered for 18-20 minutes, or until asparagus is very tender. Meanwhile, place the asparagus tips in a pan with 1” of water. Cook over medium heat for 4-5 minutes or until tender. Once cooked, set tips aside. Using an immersion blender, puree soup until smooth. 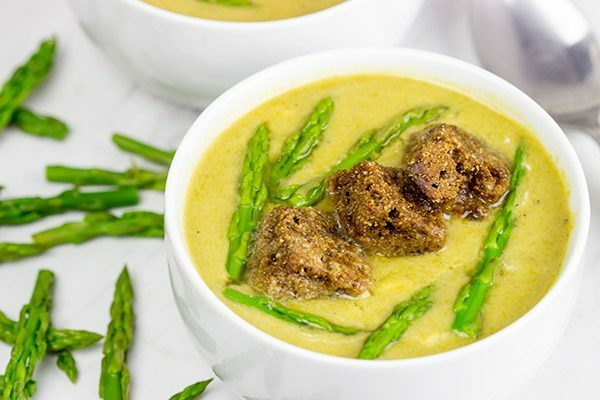 Stir in sour cream and asparagus tips. Spoon soup into bowls. Before serving, garnish with croutons. Soup is so creamy and deliocus.. Perfect for a winter evening!! I totally agree, Sharmila…and it’s super healthy, too! Thanks! I can’t remember the first fancy dish I made. I think I’ve always been cooking, even as a child. However, there must have been a first, and I’m certain there were many fails. I’ve wiped those from my memory though 🙂 This asparagus soup looks fancy enough to serve to guests and would be perfect for a light dinner! I like how you roll, David 😉 Have something lower on calories and save room for dessert. Sounds like a plan to me! I use my immersion blender ALLLLLL the time. It’s one of those kitchen tools that I love. Hmmmm, first fancy recipe? Probably a pasta dish with mushrooms and herbs and a creamy sauce. I still think about that dish and I should actually make soon. It was super good! When I think about how far I’ve come from when I started cooking, I can hardly believe it. I definitely had my fair share of duds years ago (and sometimes still do….don’t we all?). Hah…that is most definitely how I roll! I know I’m gonna want dessert, so I might as well plan for it with whatever else I eat that day. 🙂 Oh man, that creamy pasta dish sounds amazing! I have a serious weakness for cream-based pasta sauces. And yes, the asparagus in the store means it’s officially Spring. But someone needs to tell that to Old Man Winter. *grumbles* haha! Thanks, Dawn! Hi David. I make an asparagus soup that is similar to this, but I do add a cup of half and half. Like you, I reserve the tips for garnish. We usually have fresh asparagus coming up in the garden by Easter and I am looking forward to using it in many different ways. One of the first things I remember making was Baked Alaska when I was eleven. So I set out to avoid using the cream on this soup, Dorothy. (Now I have no problem with a good cream-based soup, but I just wanted to keep this one super healthy. And it worked!) I’m so excited about Spring produce. I remember you telling me about your asparagus last year, and I remember getting jealous back then, too. Ours just never took off up here…too cold probably. But it’ll be nice and cheap in the grocery store soon! Oooo…Baked Alaska! I don’t think I’ve ever attempted that one, but I have my Mom’s recipe and it always jumps out at me. Maybe one day! Thank you, my friend! hmmm I think the most fancy recipe that I ever made was macarons..and that’s why I love them so much! This soup sounds and looks so comforting David, perfect for the cold weather! I think the first fancy recipe I learned how to make was a classic cheesecake! And then the first really fancy dessert I developed was my vegan German chocolate cake. I love asparagus in any capacity and this looks truly delicious- also so does that tart- and I can’t wait to give this healthy meal a try! Hey there, Medha! You know…classic cheesecake is a really good one! I still remember when I finally learned how to make a good cheesecake. And then it’s so easy to change the flavors. And now you have me craving a slice of your German chocolate cake, too! Haha! 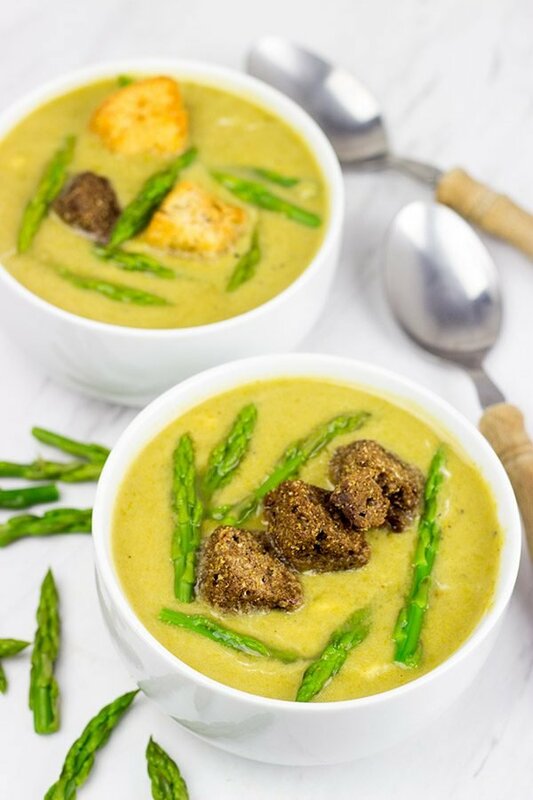 🙂 This soup is insanely easy to make…and it’s perfect for these early Spring days when asparagus is cheap at the store but it’s still cold outside. Enjoy! David! You read my mind, I’ve been dying to make some asparagus soup for awhile now, but I was thinking of an Asian-flavored soup with clear broth maybe adding some shrimp for protein. I’m not surprised your version looks wildly better than anything I was imagining. Oh, fancy fancy 🙂 Asparagus Gruyere Tart does sound delicious. My first fancy recipe was a polenta and cheese soufflé. I made it a few time and over baked it because I didn’t know exactly what t a souffle was. After 3-4 times I got the hang of it, and it became one of my signature side dishes. I ate it so much I got tired of it, but you just sparked a resurgence of my first fancy recipe. I should make it sometime this week. Oh my gosh. Polenta + cheese souffle? That sounds super fancy…and it also sounds like something I need to eat right now! You should totally make it again soon. And if you get tired of it again, then just send it to me. Hah! And this soup! I’ve always loved asparagus in any form, but I’ve never made soup with it. I’m going to try your recipe this spring for sure! Hahahaha…”lay faberge egg.” That totally had me laughing out loud this morning, Marissa. Thank you! I’m going to google the rest of that list shortly! You should totally try making soup out of asparagus! It’s perfect for these early Spring days when asparagus is on sale at the store, but yet it’s still cold outside. Thanks, my friend! Hmm that’s a good question, I wonder what the first “fancy” dish I made was… can’t recall for the life of me, but all of your talk about delicious dishes is making me hungry! Skinny soup is my favorite because it’s still nice & filling, yet light. We have had a bundle of asparagus sitting in our fridge for almost 2 weeks. Ha Ha Ha! We officially look at it as “THE ASPARAGUS”….. But now, NOW, we have a way to cook it! GIGI! That asparagus is going to start to develop thoughts and opinions about you if you just keep staring at it. 🙂 I say turn it into soup! It’s super (souper?) easy, and super light in calories, too. Thanks, my friend! Hmmm…you’re right! I am indeed on a bit of a healthy roll right now. But I’ve got some cookies today to help make up for it! 🙂 Oh man, you’ve GOT to go get an immersion blender. I use mine all the time to make creamy soups. I mean this soup is super smooth…all thanks to the immersion blender! I’m thinking chorizo would be a great addition here…in more ways than one! Haha. Hey! If you were making pancakes at 5 years old, then that totally counts as fancy, Ben! Heck, I’d be happy if someone wanted to make me pancakes today. Maybe in another 3.5 years Robbie will do that for me. Haha! No lavender in Russia? Like none at all? Now I know why you moved! Good tip about the bit of butter in soup. I sometimes do use cream, but I try to be aware of how much I’m using. Happy Thursday, my friend! My first fancy recipe would have to be my Mom’s meatloaf, and that was no easy feat. I made it for husband on our honeymoon and it was delish, he’s still alive 20 years later so I must have done something right. 🙂 BTW-this asparagus soup is divine!! This is a new one- I don’t think I’ve ever had asparagus IN a soup, let alone a soup based primarily off it! This looks delicious! My first ‘fancy’ recipe made a mess in my oven- It was a mix of cinnamon roll cake meets breakfast casserole and while delicious…it errupted! Yes! 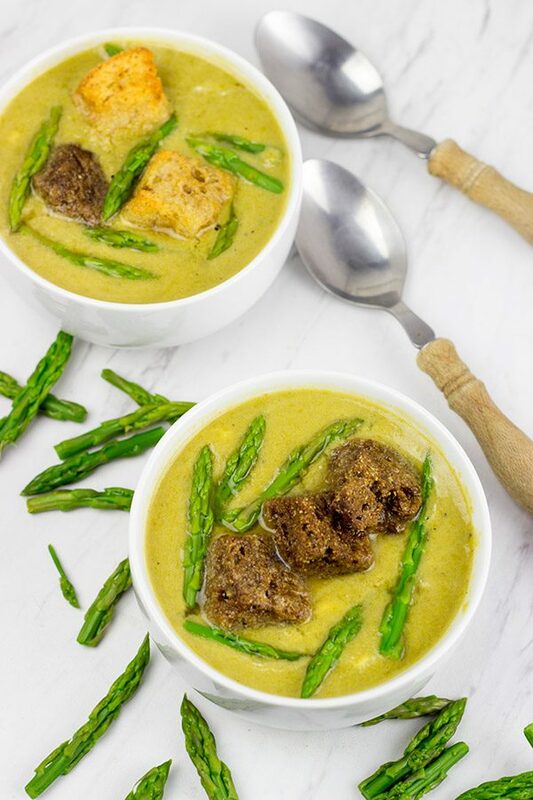 Asparagus can indeed become a soup..and it’s pretty darned tasty. (Not to mention pretty darned healthy, too!) So I really wish you had pics of that cinnamon roll lava volcano…haha! With asparagus in season, I need to try this next week. I’ll follow your directions the first time. With a few substitutes, this could easily become a vegan soup. Vegetable stock subbed for chicken stock is easy. I wonder how the soup would taste if cashew cream was substituted for sour cream. You’d lose that soured taste unless you added a little lemon juice to the cashew cream. A store bought vegan sour cream might work too. Yes! This one is perfect for these early Spring days when asparagus is on sale at the grocery store. And you’re right, you could turn this one into a vegan recipe pretty easily. Thanks, Jonathan! 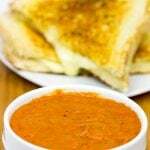 Asparagus and tomato soups have always been my favorites since I was young. I like the idea of using sour cream not only for the consistency of the soup but the additional flavor it adds…nice. Thanks so much, Karen! I do love a bit of sour cream in soup…the flavor is awesome! And this soup comes together quite easily. Perfect for these early Spring days when asparagus is so plentiful. Thanks, my Florida friend! The first fancy recipe I learnt to make was Banana Flambe, if that counts. Haha. 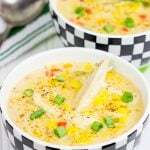 This asparagud soup does look great and fairly easy to make. Deserves an attempt, once I get over my uncertainty with asparagus. I’ve never made it or worked with it before, would never know if I’m doing it right. Any tips? Zuccotto. That was the first fancy thing I made. Every so often, I’ll make one at Christmas. It’s still pretty fancy. I have a special place in my cooking repertoire for Martha’s recipes, and the first Zuccotto I made was one of hers. She and her team are excellent recipe writers; that was especially so in the pre-prison years. I learned tons. Soups, though, I learned from Mollie Katzen, and I’ve been a fan of asparagus soup (and immersion blenders) ever since The Moosewood Cookbook came out. Zuccotto is totally a fancy recipe, and I wouldn’t mind one bit if someone wanted to show up at Christmas with that one! So we might have different opinions about Martha, but we do share a love for tasty food, Jeff! I’m not familiar with Mollie Katzen, so I’ll have to go do some googling now as I do love a good soup!